Yesterday I did something that I've never done before in my whole working life. I took a day off work to do nothing. In fact, I took two - I plan on having a duvet day today too. I am protective over my annual leave. I get a decent amount, but not enough to be able to go to all the places that I want to or see all the people who I don't see enough. I plan meticulously to make sure I'm utilising my holiday efficiently and squeezing in as many as trips and days out as I possibly can. I have always secretly judged people who take days off just for the hell of it. I just never saw the attraction of "wasting" a days holiday doing nothing. I didn't even leave the house yesterday, but it was probably one of the best uses of a days holiday ever. The truth is, I needed a rest. I needed a day where I wasn't continually checking work emails or worrying about blog posts or sitting in traffic or rushing around. I needed a day where I didn't even have to worry about getting dressed. The past month has been busy and tiring and intense and emotionally draining. And through it all we have been focussed on keeping busy and looking after the kids and keeping in touch with friends and sorting the house out and getting back to work and keeping on top of everything so that we don't let anyone down. And keeping busy has helped us. It has given us a purpose and a focus and a reason to get up every day. But we have been so focussed on keeping busy that we haven't given ourselves time to rest. And I knew that if I didn't slow down and give myself some time out then I wouldn't be any good to anybody. I knew that with a frazzled mind and a run down body I would make mistakes at work and be a grumpy girlfriend and feel too worn out to help out with my family. And so yesterday I slept in. I wore my gorgeous ASOS PJs all day. I drank at least 8 cups of tea. I watched trashy TV on the sofa with a blanket round me. I went back to bed for an afternoon nap and enjoyed my gorgeous new bed sheets. I read two books. I caught up on my favourite blogs. I hung out with my Mum. I ate a lot of comfort food. And it was bliss. It was absolutely, totally just what I needed. I have woken up today with a clearer mind and a little bit more energy. I feel calmer and less panicked by everything. I feel more creative and inspired. And it has taught me that actually, sometimes we all need a duvet day. We all need some time every now and then to totally switch off. It made me realise that using a day or two of annual leave to just give ourselves a little break is definitely not a waste. That sometimes what we need is to jump on a plane and explore somewhere new, and sometimes what we need is to stay at home and read a lot of books and see nobody but family. I've been converted. Duvet days are good for the soul. 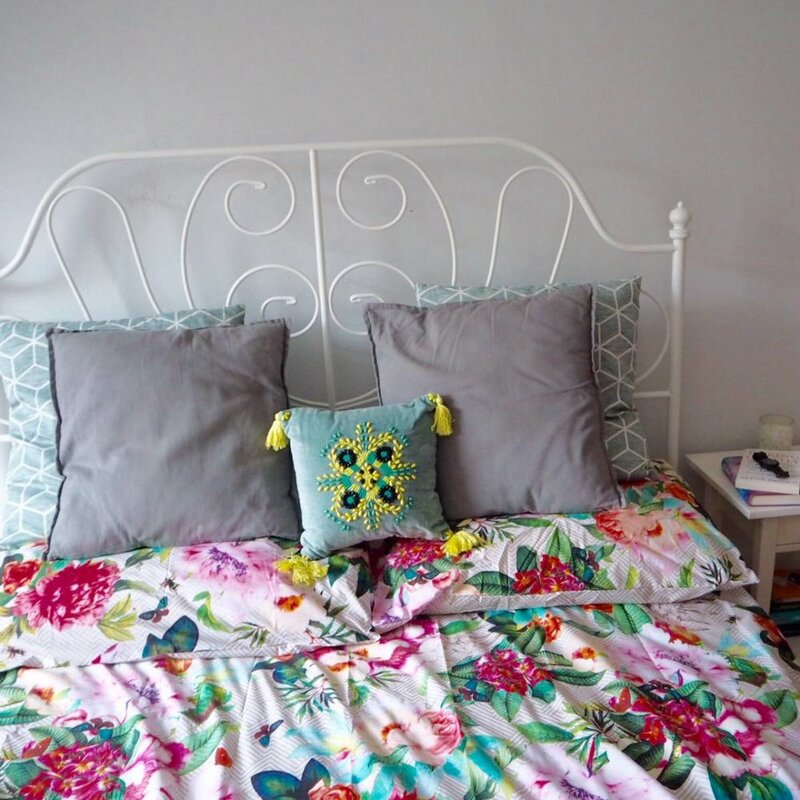 Thank you to Debenhams for sending me this beautiful set of bedding - it definitely made my duvet day comfier and prettier!